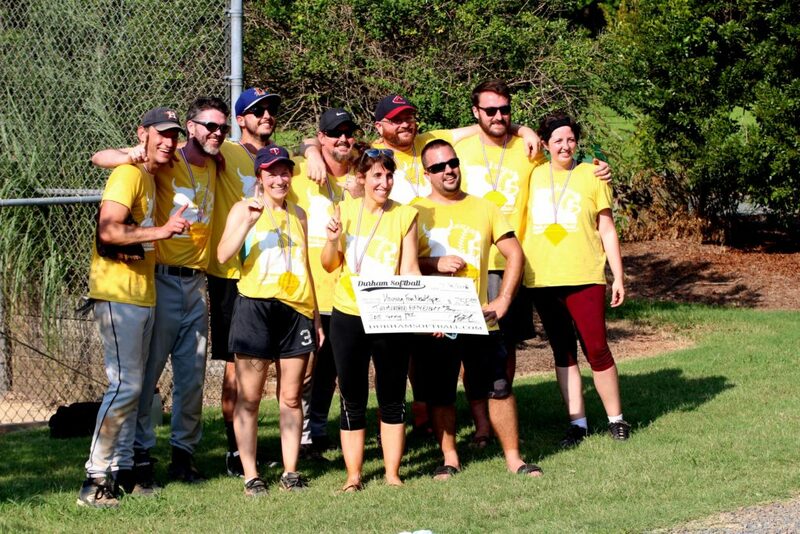 Durham Softball is a charity co-ed adult softball league in Durham, NC. We have partnered with local non-profit organizations and businesses to create a fun, competitive, and rewarding softball league. 100% of the net proceeds from the league are donated to our partner charities and teams will compete during the season to earn a larger share of the donation pool for their charity. The more the team wins, the more their charity will receive. You can sign up as an individual or bring a group. Just bring a glove and have fun helping raise money for worthy local causes! In our inaugural 2018 season, over 225 players helped us raise $2,800 in cash donations and more than $4,000 in physical item donations for our sponsors and we hope to make a bigger impact in our community this year. 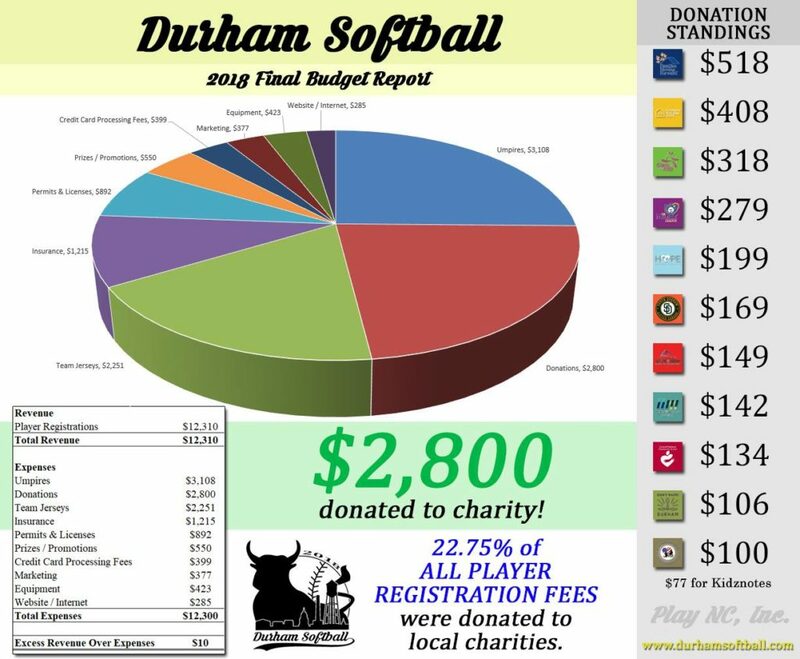 Our league is currently partnered with a great group of diverse charity organizations in the Durham community and we hope to have even more community partners signed up before the end of 2019. Registrations for our Spring season have sold out, but registrations for our Summer 2019 Softball season will begin on April 1, 2019! Thanks for your support! See you in the Spring! We have SOLD OUT all 16 Teams this Spring. Registrations for Summer League will open soon! CPCANC, assists low-income families and individuals, including the working poor. Crayons2Calculators, provides Durham teachers with the supplies they need for classroom success. Don’t Waste Durham, creates solutions that prevent trash at its source. Families Moving Forward, provides families with children a stable, safe and loving environment. Girls on the Run of the Triangle, positively impacts young girls’ lives. Hope Animal Rescue, committed to improving the lives of abandoned animals in North Carolina. Housing for New Hope, mission to prevent and end homelessness. Josh’s Hope, serves ages 18-35 who live with mental health conditions and/or struggle with a substance disorder. Kidznotes, pre-K through 12th grade out-of-school musical program. Meals on Wheels of Durham, enhances the quality of life for seniors and people with disabilities. Miracle League of the Triangle, positive experiences for children and adults with special needs. North Carolina Fallen Firefighter Foundation, leads the effort to remember North Carolina’s fallen firefighters and their families. PORCH-Durham, support food-insecure children and families of Durham through BackPack Buddies, school pantries and community pantries. South Durham Little League, provides baseball for children between the ages of 4 and 14. Vets to Vets United, significantly improve a veteran’s life by providing companionship.